Add coriander, cumin, red pepper flakes and ½ cup of black beans, liquids to a medium skillet. Heat over medium low and let cook until liquids have cooked out, anywhere from 5-10 minutes. Taste and adjust pepper if needed. Slice avocado in half. Brush with the one teaspoon of olive oil. 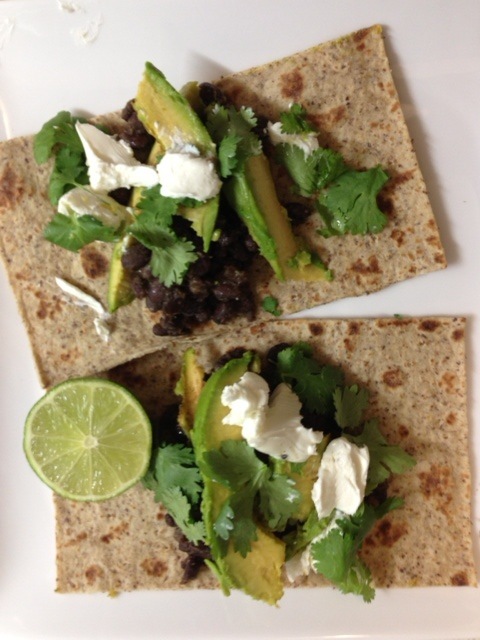 Place ¼ of the black bean mixture in the center of the tortilla, layer avocado and goat cheese on top. Lightly drizzle with lime juice and cilantro leaves.